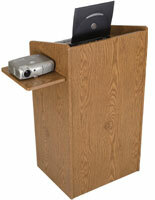 Red oak is the most common hardwood grown in the United States today. 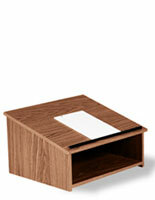 Used just about everywhere, the material is so ubiquitous that people have taken to simply call it "wood". 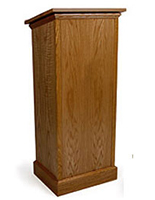 But this is an unfair statement. Very hard yet affordably priced, this species offers excellent value when it comes to being used for flooring, furnishings, and cabinetry. 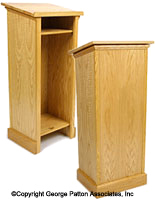 Our collection of oak finish podium stands offers perhaps the largest variety of sizes and styles available in our "lecterns by color" series. 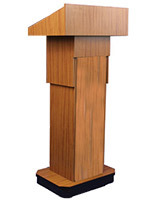 Choices range from real wood veneers to man-made melamines and laminates, each with their own price ranges, in tabletop and floor-standing iterations. 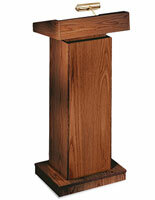 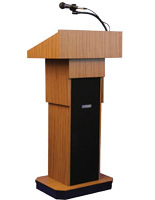 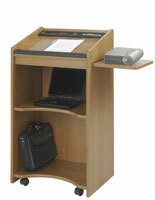 The oak finish podium stands that feature wood veneer live on the pricier side of the spectrum. 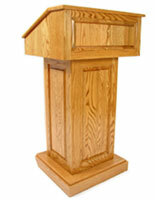 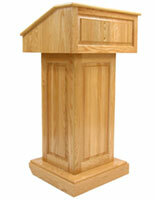 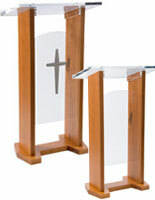 But if your looking to buy a fully assembled lectern with the look of real wood, you can't beat it. 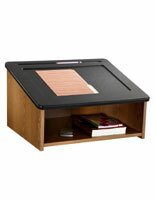 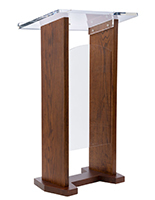 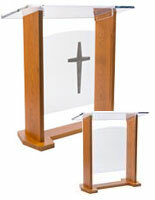 We offer lecterns with light and medium stained finishes underneath lacquer clearcoats. 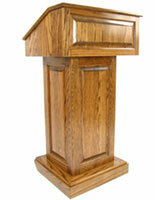 The tell-tale grain pattern of oak is quite pronounced and demonstrated to great length in the veneered models. 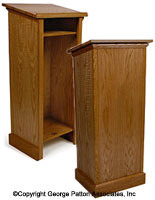 From simple reading stands to cabinet-style pulpits, there is a style for everyone in religious or secular environments. Oak finish podium stands manufactured with plastic laminates offer a more subtle grain pattern when compared to real veneer. These models also ship flat with assembly required. 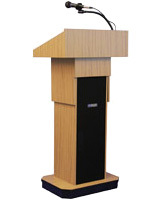 Height adjustable lecterns are available in combination with optional wired or wireless amplified sound systems built right into the unit.